For as long as I can remember now, I’ve been closing out my days and ushering in my evenings with a warm bath. For me, a freshly scrubbed, clean bath tub, some gently-running warmish-hot water, and a few squeezes of an aromatic body wash or bubble bath to foam and make things all sudsy makes me a very happy girl. It allows me a little time to contemplate my day, and quiet my soul. A bath is truly one of those simple things in life, a comforting and soothing little “luxury”; but it does wonders for my spirit and for my mind. It allows me to reflect upon all of those things that I’m grateful for, and that I experienced in the day that has gone by. It allows me to draw a distinct line between my day and my night, to differentiate and to retreat, and it is something that I’m truly grateful to have as a part of my daily ritual experience. And so it is with many of those simple little things in life that just simply make us happy; they renew, uplift, and feed us in so many necessary ways! And a simple meal prepared with fresh, colorful ingredients is a wonderful example of such a lovely thing. 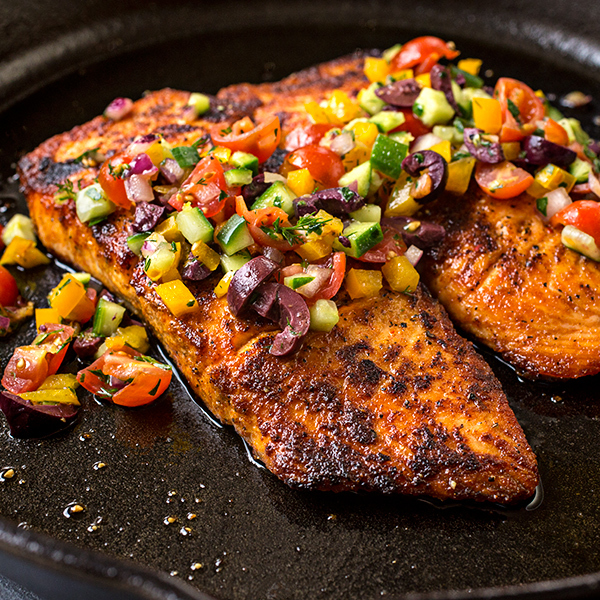 A mildly spicy salmon fillet placed into a hot cast-iron skillet to sear to a succulent, golden-brown perfection, and then topped with a mediterranean-inspired salsa fresca that offers a bit of cool and bit of bright-tanginess, makes for a perfect pan seared salmon, and makes an appetite happy. It gives comfort, and becomes a delectable little luxury of a meal. It warms from within, and offers an opportunity for gratitude for each bite taken. So I find that often times, it’s the simplest things in life that offer the most joy and happiness. A bit of waning evening sun on the cheek; the gentle bubble of a fountain; a quiet walk around the block in the morning; or a burst of savory, fresh, and succulent flavor on the tongue. All go easily into that little category, that cream-colored folder labeled “simple things that make me happy”, and give life that precious bit of spice that it needs. 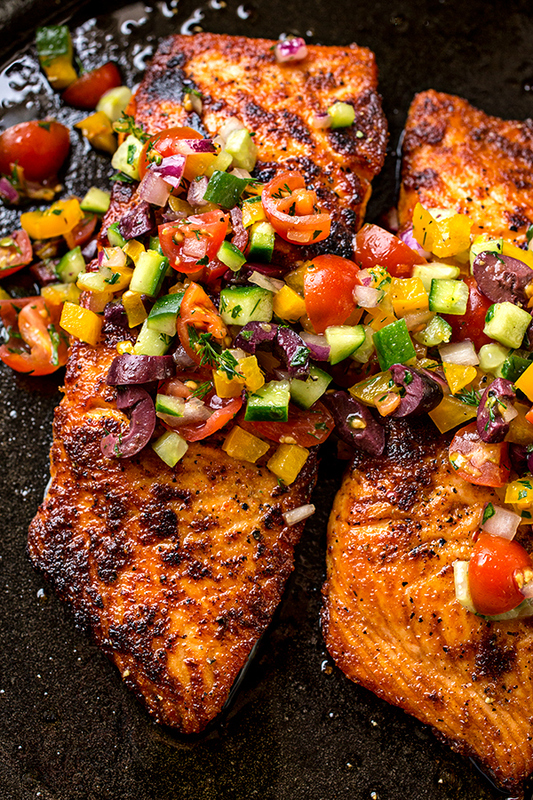 -Place the salmon fillets onto a plate or into a large bowl, and drizzle in about 2 tablespoon of the oil; then, sprinkle in the paprika, the granulated garlic and onion, the cumin, coriander, salt, pepper, cayenne and lemon zest, and toss everything gently to coat the fillets evenly and well; allow the salmon to marinate for at least 20 minutes, or even over night. 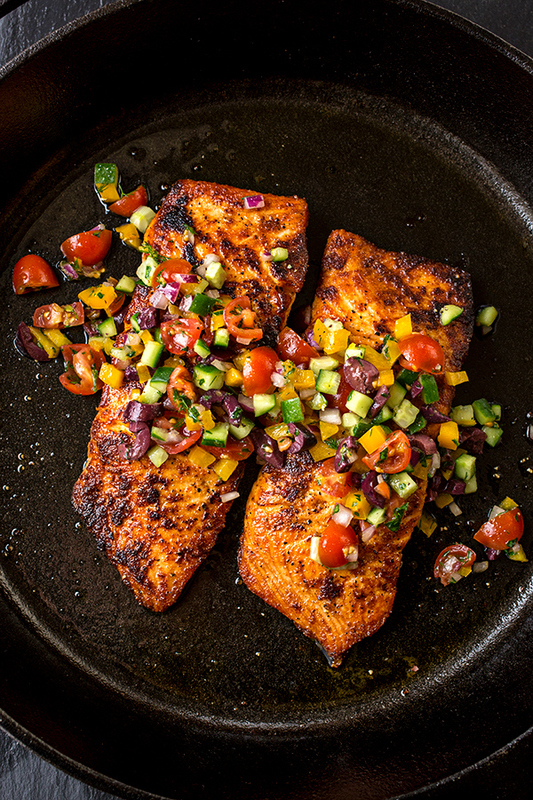 -Place a large cast-iron skillet over medium-high heat, and drizzle in about 2-3 tablespoons of the oil; once the oil is hot, add in the salmon fillets, and allow them sear on that first side for about 4 minutes, or until a deep, golden-brown; then, flip over and allow them to cook and sear on the other side for about 4 more minutes; remove from skillet. 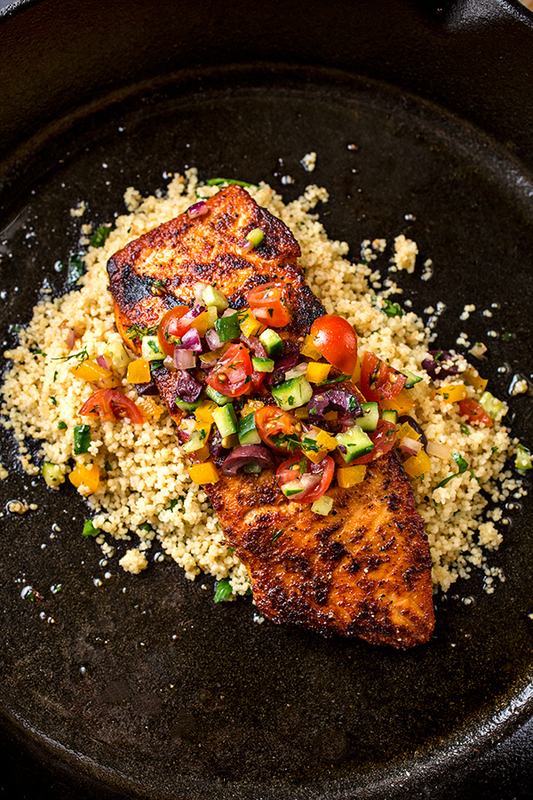 -Serve with seared salmon generously topped with the Mediterranean Salsa Fresca, and a side of Toasted Couscous, if desired. -Combine all ingredients up to and including the lemon juice in a small bowl, and add a couple of pinches and salt and pepper; mix with a spoon to combine, and serve immediately, or keep covered and in the fridge until ready to serve. -Place a medium-small non-stick sauce pan or pot over medium heat, and add in the couscous; toast the couscous, stirring it frequently, for about a minute or so, and then pour it out of the pan/pot; set it aside for a moment. 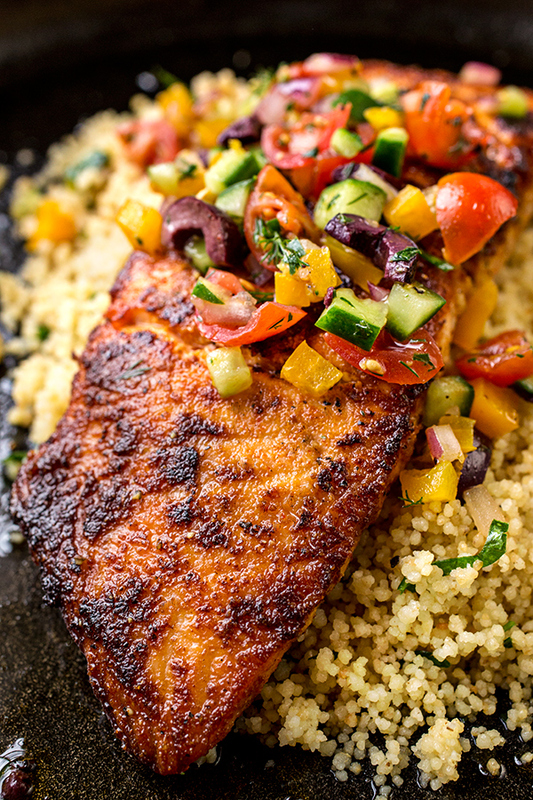 -Into that same pot or pan add the water, a couple of pinches of salt, the olive oil and the garlic, and stir to combine; bring the water to a vigorous simmer, pour in the couscous and stir, and turn off the heat; cover with a lid, and allow the couscous to soften for about 5-7 minutes; then, fluff with a fork, add the chopped parsley, and toss to combine; serve warm. Oh dear, this meal was amazing!!! I subbed olive oil for canola and omitted the olives because I didn’t have them, but this was so, so good! It’s going to live somewhere at the top of my favourite recipes ever. 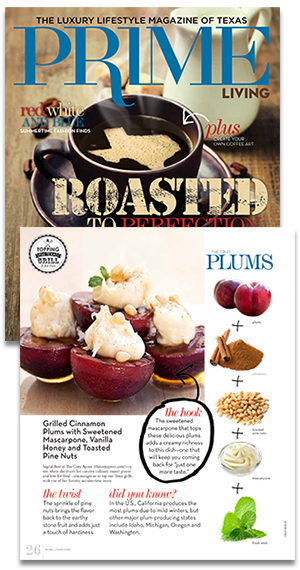 Amy, I’m thrilled to read that you enjoyed this recipe so much! 🙂 Thanks for sharing your experience with me! Can I use cod fish for this recipe? I made this last week and it was a huge hit with the whole family. My husband said it was his new favorite. All the kids ate it up too (ages 3, 5 & 9.) I didn’t put olives in the youngest. I added a little red wine vinegar to the salsa and I had a small hunk of feta that needed to be used up so I added it too. Next time I will add some avocado too. I loved how fresh everything was and so quick to prepare. Rice is a great sub if you can’t do pasta. Thanks for the great recipe. I will be making this again. 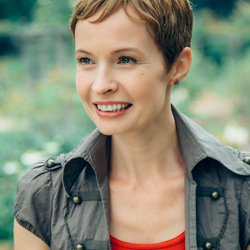 Hi Kate, thanks so much for taking the time to share your experience with me! So glad you all enjoyed this recipe, and I’m thrilled that you made it your own, and will be preparing it again in the future! 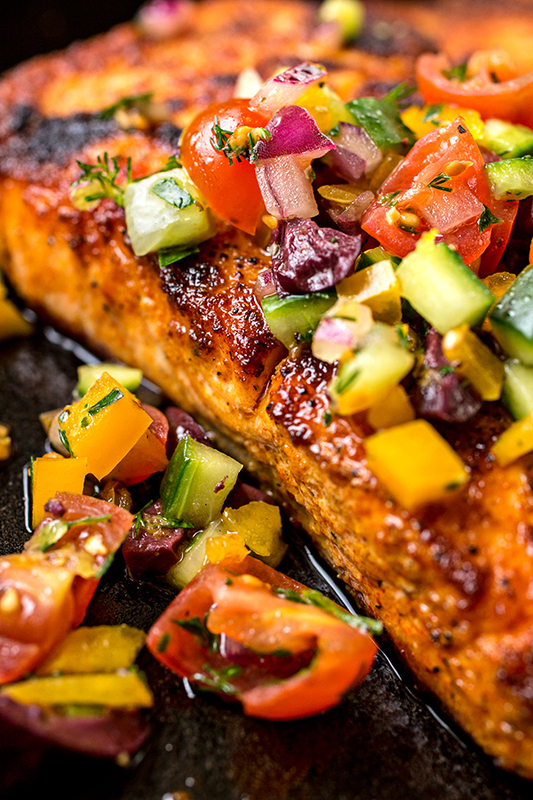 This was the BEST Salmon we have ever tasted. The spices and Salsa were perfect. Brenda, that’s great! What a compliment. 🙂 Thanks so much for taking the time to comment on your experience! Do you have nutritional information for this meal? Hi Jill, I just did some quick math, and a serving has 686 calories. I just tried this recipe and it was amazing! Absolutely loved it! Thank you so much for sharing it! Hi Annamei, thanks so much! I’m thrilled you enjoyed it— it’s nice and healthy and fresh, and a recipe you can feel good about eating. Thanks so much for commenting! Everything was great. Would have been very time consuming if I was doing it alone, all that chopping, I’m slow. But it was a good excuse to get my fiancé to help me in the kitchen. Also we added pepperocini peppers to the salsa (diced). It was so good. Added an extra kick we needed! Alexis, glad you enjoyed the recipe! Yes, sometimes there’s a good amount of chopping involved, but as you said, it’s all worth it when the meal is good, and you get to work side by side with someone you love. So wonderful that you and your fiancé tag-teamed this; and those pepperoncini peppers in this dish sounds absolutely delicious! Thanks for sharing. This recipe looks fabulous! However I don’t have a cast iron skillet – would a regular nonstick skillet provide the same results? What do you suggest I use instead? Thanks! Hi Amanda, no problem! A nice heavy, heavy-bottom pan (like a cast-iron) that conducts heat well is best for that nice “sear”, but you can totally use your non-stick. 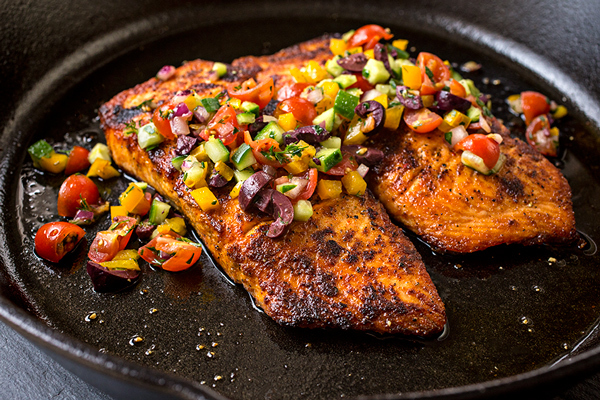 Get it nice and hot, and leave the salmon undisturbed for a while on that first side to create as much color (and flavor!) as you can. Hope you enjoy the recipe!